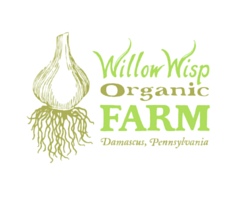 Located in the Upper Delaware River Valley, Willow Wisp grows a diverse mix of vegetables, herbs, and cut flowers on their 12 acres. Tended with care, their valley bottom soil grows delicious and nutrient-dense produce. Farmers Gregg Swartz and Tannis Kowalchuk take the long view that while growing food, they should always be improving their soil, increasing the farm’s biodiversity, and contributing to their community. They do this by using cover crops, crop rotation, and creating insect and wildlife habitat. They use no pesticides, herbicides, or synthetic fertilizers and are Certified Organic by NOFA-NY Certified Organic, LLC.